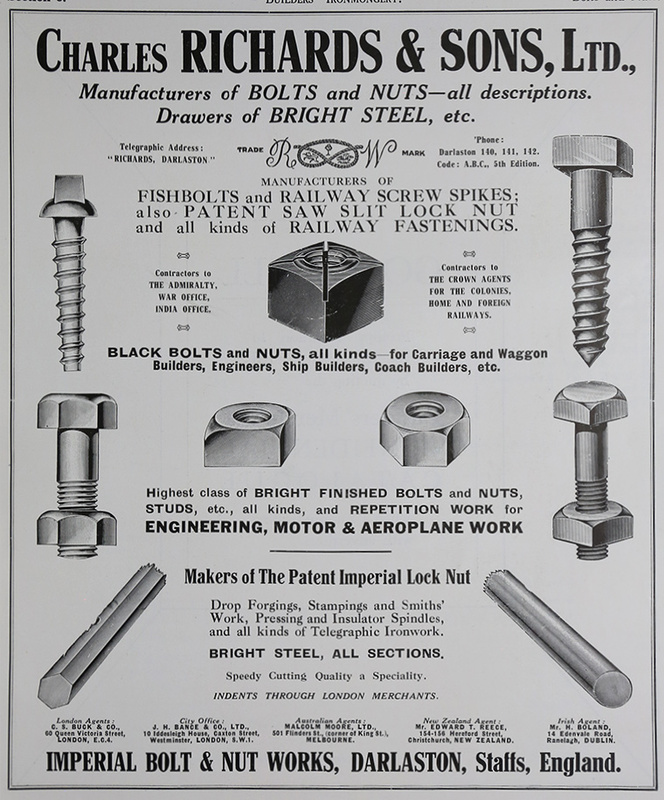 of Imperial Bolt and Nut Works, Darlaston, South Staffordshire. Telephone: 140, 141, 142, and 230. 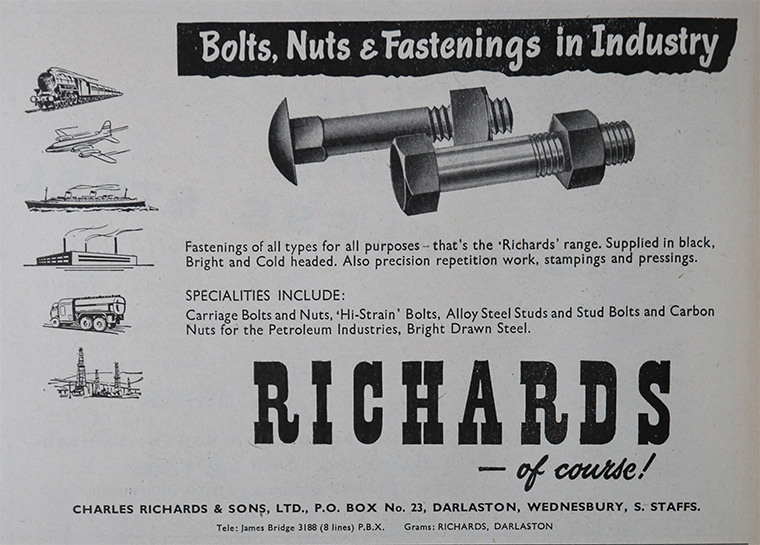 Telegraphic Address: "Richards, Darlaston"
1870 The company was founded by Charles Richards, who had served an apprenticeship with a local nut and bolt manufacturer. 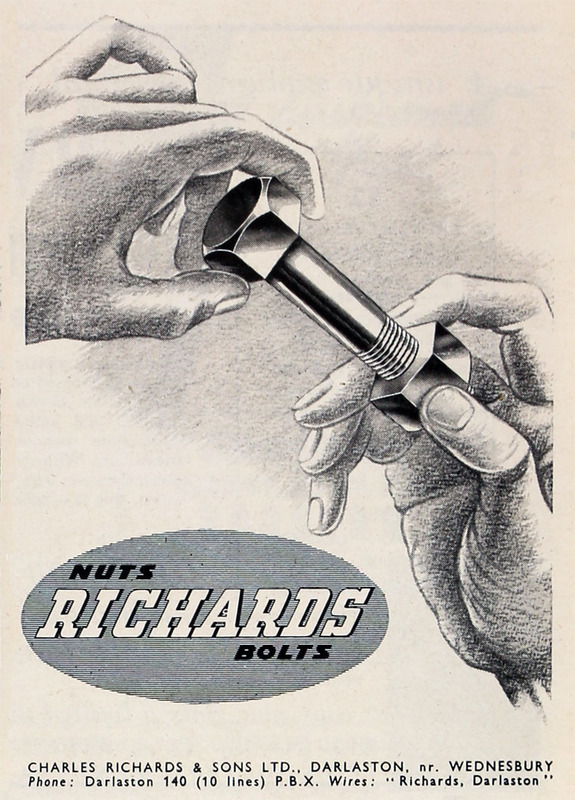 With William Butler as partner, he began to make his own nuts and bolts at the Lion Works in Foster Street, with a staff of 40. 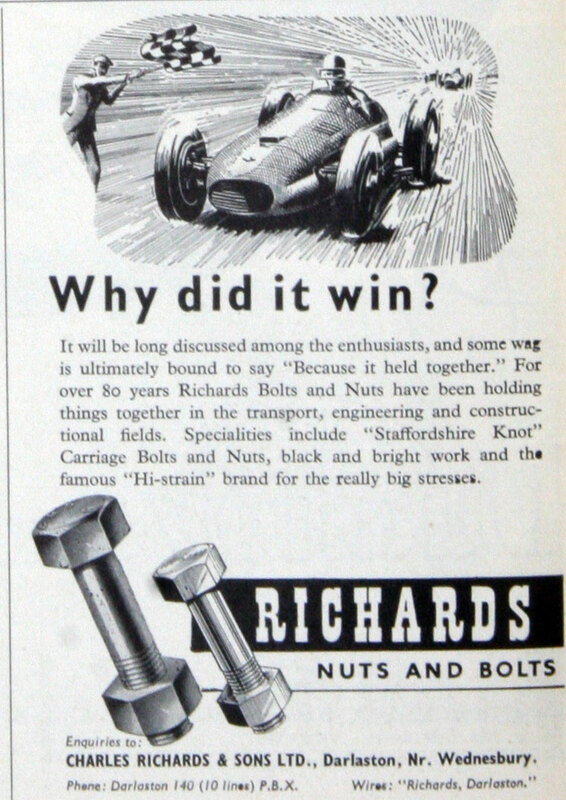 Their main products were carriage nuts and bolts for railways and horse-drawn vehicles. Butler left the business, and was replaced by Mr. Wynn and the firm became known as Richards and Wynn. 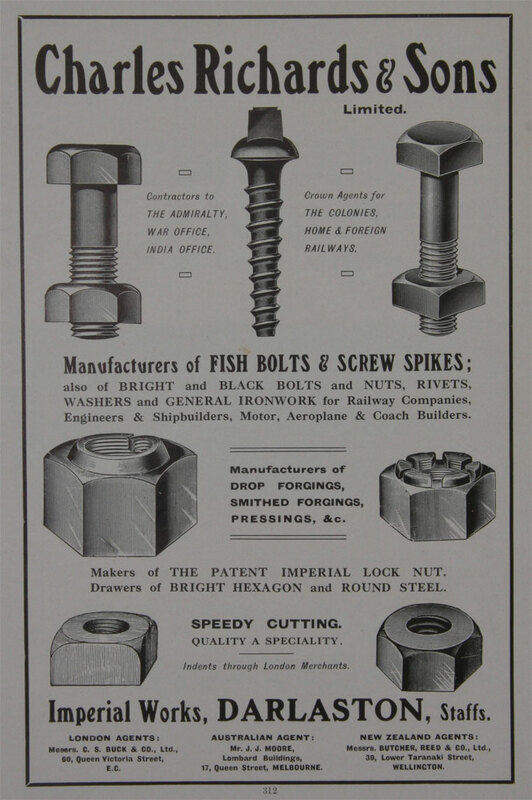 They produced a wide range of products: bright and black engineer's bolts, coach bolts, nuts and set screws, collar screws, axle bolts, shoful, clarence and bed clips, boiler studs, shackle plates, "D" shackles, carriage bolts from Swedish iron, deck bolts, handmade hot pressed nuts, bolt ends and rivets, and telegraph iron work. As demand for the company's products increased, Oak Works and Phoenix Works were also acquired. 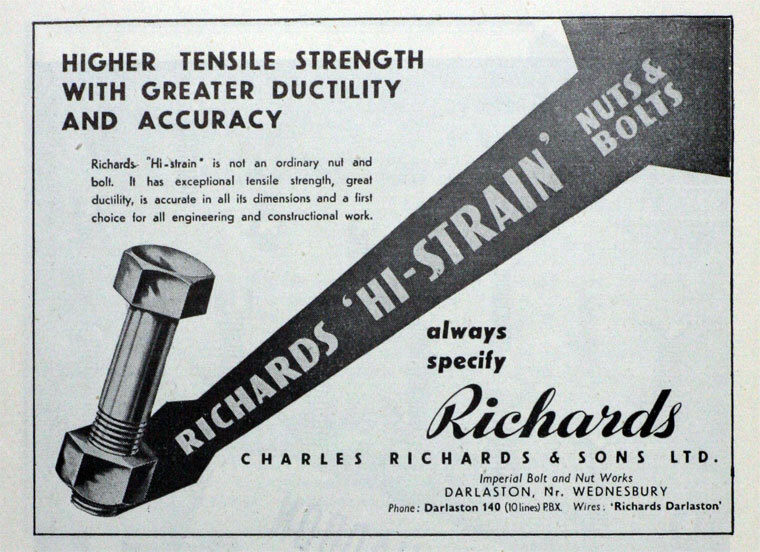 Mr. Wynn retired and Charles Richards' four sons joined the company, continuing the company as a family concern. 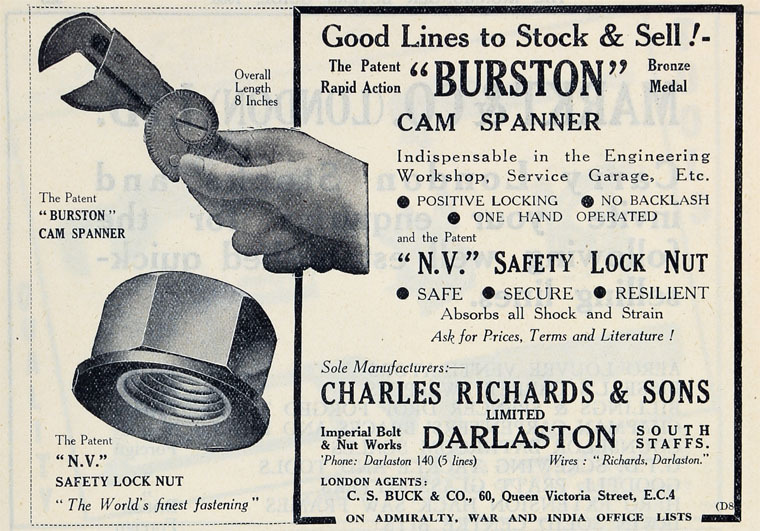 1891 The Imperial Works were acquired at Darlaston Green, and the company closed the original works and moved into their new factory, formerly part the Darlaston Iron and Steel Co. The site covered three acres and included stock and packing warehouses, an oliver shop, and a large machine shop for making blanks. The works also included an extensive blank warehouse, a screwing shop, blacksmith's shops, and forges etc. Modern machinery was used throughout the works including powerful engines to drive the machinery, varying from 20 hp to 60 hp. Goods were transported by the adjacent canal and sidings from the nearby London and North Western Railway. Only the best raw materials were used, including Swedish iron. 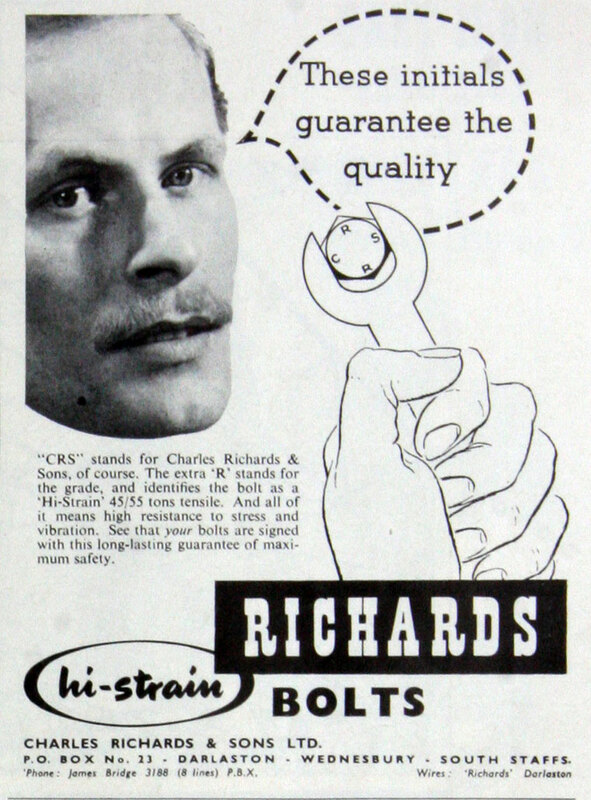 1905 Charles Richards Senior died and was replaced by his son Charles, who had outstanding business abilities. 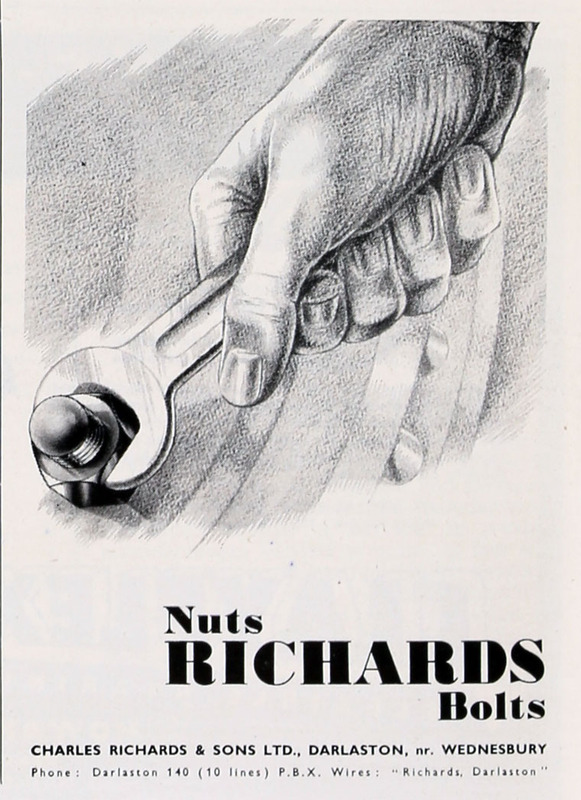 The company again dramatically expanded with a new factory on the Flatts Estate, where they produced nuts and bolts, repetition parts, and special turned bolts made from hot or cold forgings. The various buildings eventually covered many acres and were equipped with the most modern tools and machinery possible, including a galvanising plant. 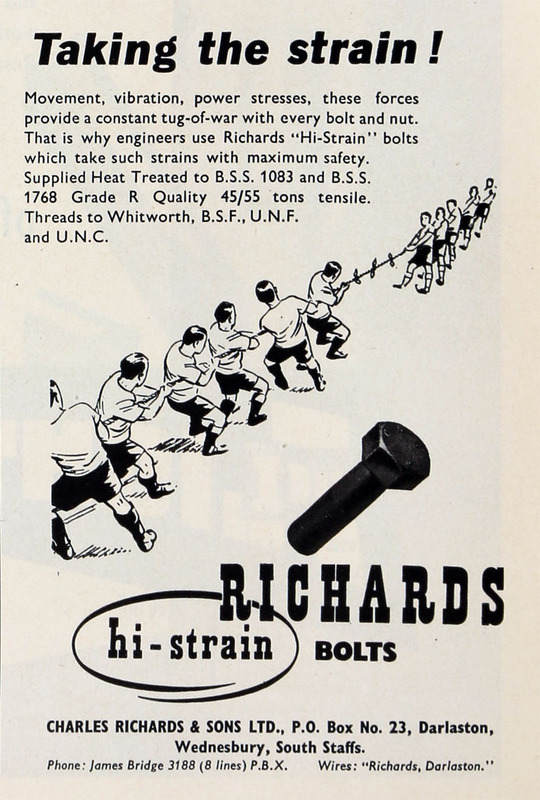 Blade hot forged products and rail and telegraph fittings were added to the product range and sold world-wide. 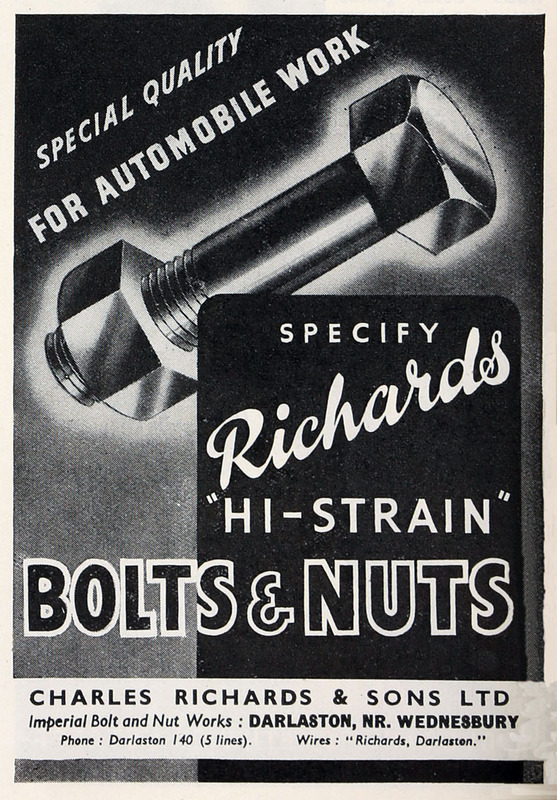 The company became one of the world's largest private nut and bolt makers and was also one of the largest employers in the area. 1938 London Agents were C. S. Buck and Co of 60, Queen Victoria Street, E.C.4. Post WWII. 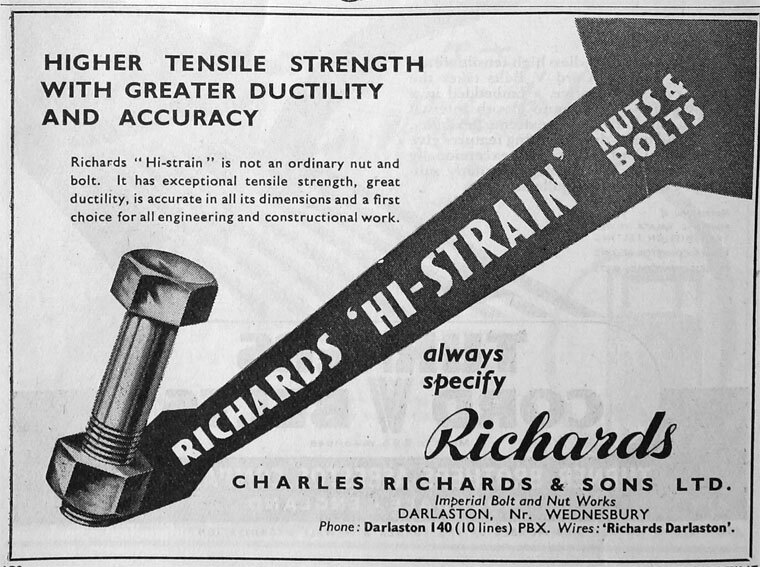 Charles William Richards (1893-1978) ran the business together with Arthur Samuel 'Sam' Richards (1905-1956) along with their cousin William Henry 'Harry' Richards (1890-1967). 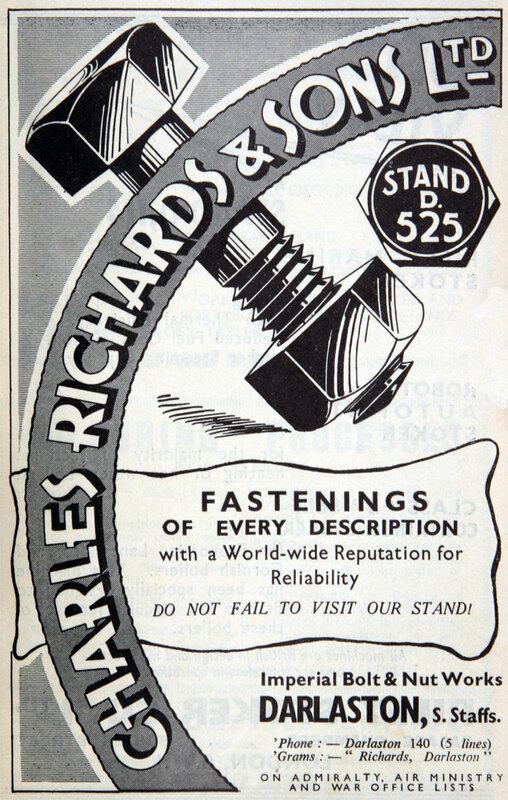 Charles W. Richards' son Peter Richards together with John Richards Grant continued until the business was sold to a South African business in June 1980. 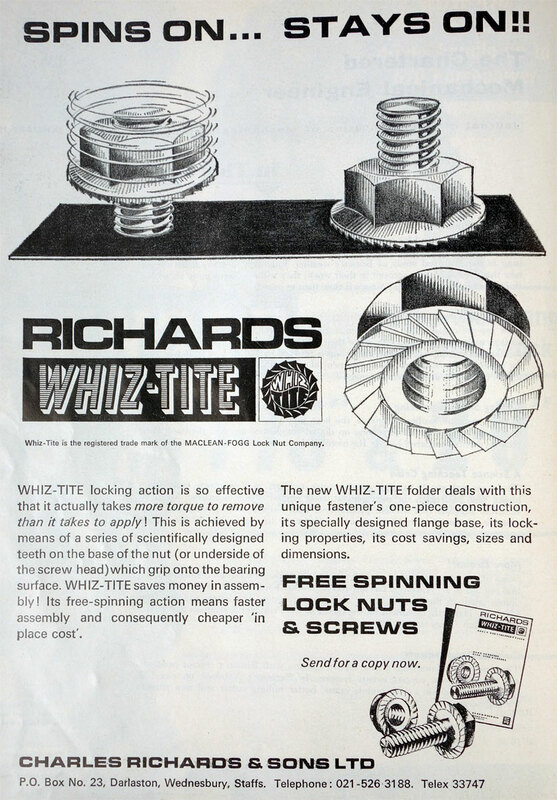 Robin Richards joined the business in September 1968 as a trainee metallurgist, studied at Wednesbury Technical College, West Bromwich College of Commerce and Technology and Wolverhampton Polytechnic graduating with a BSc (Hons) Degree in Metals Technology. At the time of the sale on 1980, Robin was Quality Manager with the business achieving a BSI Registration to BS5750 (now ISO9001) during the final years of family ownership. 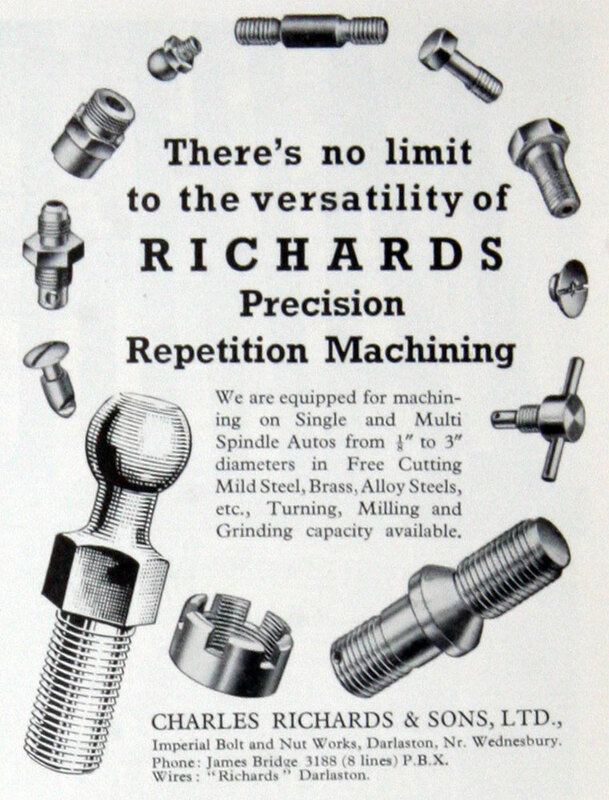 All family employees became redundant with the change of ownership including Phil Perkins who was Harry Richards Son-in-Law and managed the Andrews Fasteners subsidiary in Leeds. 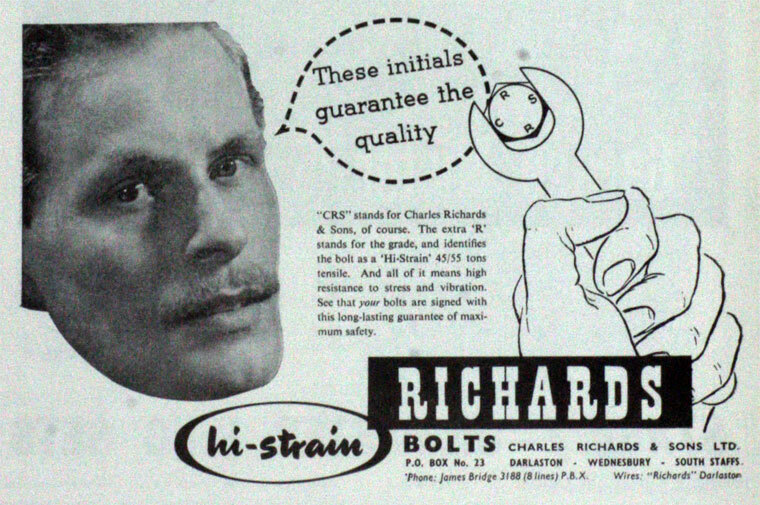 Charles William Richards (1893-1978) purchased or established the Midland Bolt and Nut Co which was managed as a separate entity by Sam (Arthur Samuel) Richards 1905 to 1956 but was later absorbed by Charles Richards Fasteners.